Mort Kunstler Handsigned and Numbered Limited Edition Giclee on Canvas:"Col. Robert Shaw and the 54th Massachusetts"
About the Art: The 54th Massachusetts Infantry was the first volunteer black regiment raised in the North. The ranks were filled with former slaves and freedmen, all sharing the same dream of serving their country. 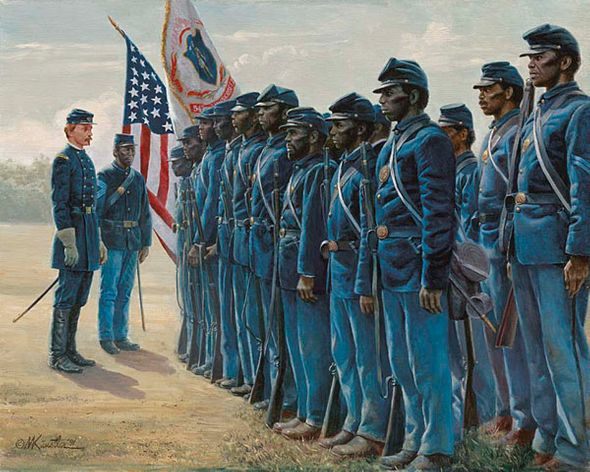 Under the tutelage of its firebrand colonel, Robert Gould Shaw, the 54th became a model of perfection in drill and camp. Their true test came in battle, a suicidal assault on Battery Wagner on the South Carolina coast. Killed on the ramparts of the fort, Shaw was buried in an unmarked grave with the casualties of his regiment.